Are you one of those people who wanted to have a modern interior style in building your dream house? If yes, then this featured house for today is just right for you which is one of the successful designs made by the E. Cobb Architects. The façade of this house appears to be square boxed form of architecture. It is located near the sea. This is composed of solid concrete walls from the concrete materials. As you can see there is an expansion between the walls. 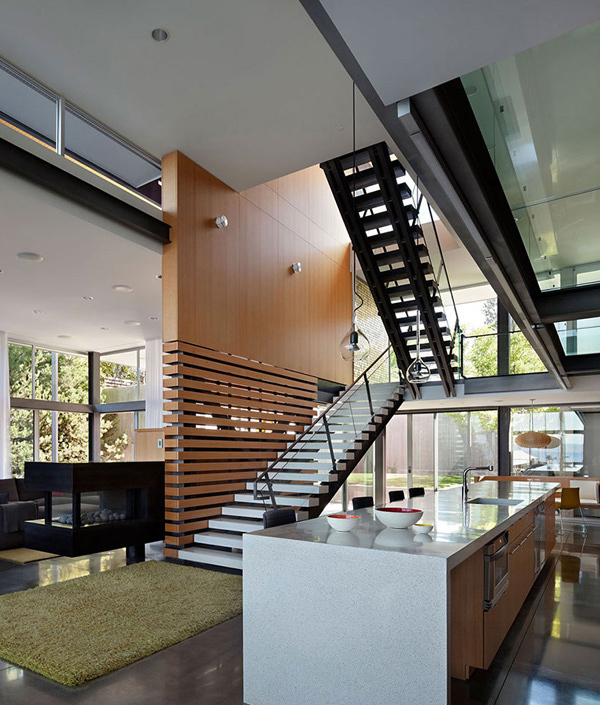 The terrace in this house helps a lot in making it look more spacious. Well, this home is called the Graham Residence. This is proud to display not only its exterior but most of all its interior. The design in the interior is composed of a large room. It is divided in several areas that include the living, dining, kitchen and the others as well. This residence is separated into many different floor levels. Each of these levels displayed the different form, size, and form type. The highest level is partly attached to the bottom part of the façade so it looks like hovering it. There are some wooden walls inside that serve as the borderlines to limit every space by setting it in its designated places. Most of the walls here have a large transparent glass so one can see the side views from the inside of the modern building. Also, there is a black stairs in this house and it connects each levels. Some of the walls that is found near the stairs has a striped structure. Different sofa and other beautiful chairs are placed in every spaces of the interior. The color combination of the paints used in the interior is very fascinating. There is also a pink bedroom here because of its pink palette walls inside. 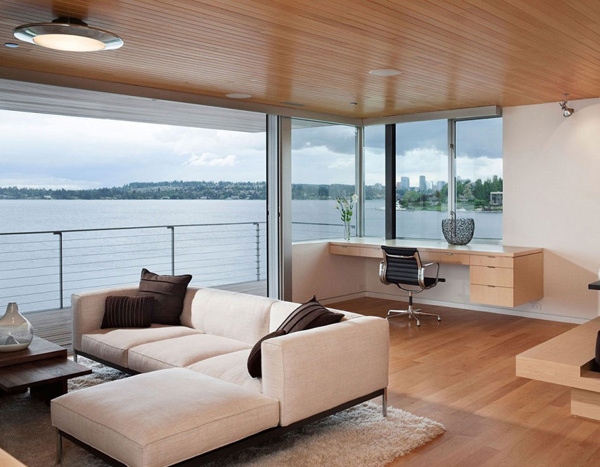 From this room, the client can straightly see the stunning view of the ocean. The lamps inside are arranged in a way that it is parallel to each other. 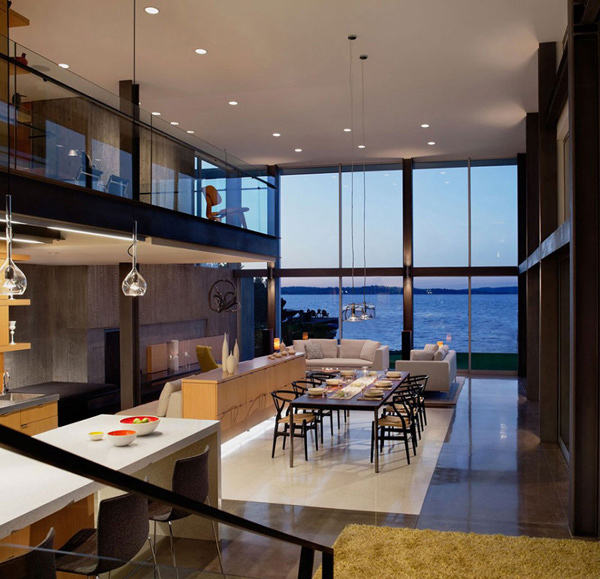 Some lights were hung in some areas of this residence to maintain its elegance. The lovely oceanic view is enjoyed by the client through some of the rooms that is facing the sea. However, the home yard here is consists of a flat green grass. The swimming pools also sweep away on the sides of the fence wall. Various trees are set in the opposite with the pool and the grey terrace. Now are you ready to be amazed more of the elegant interior of this Graham Residence? Why don’t you check the images below. 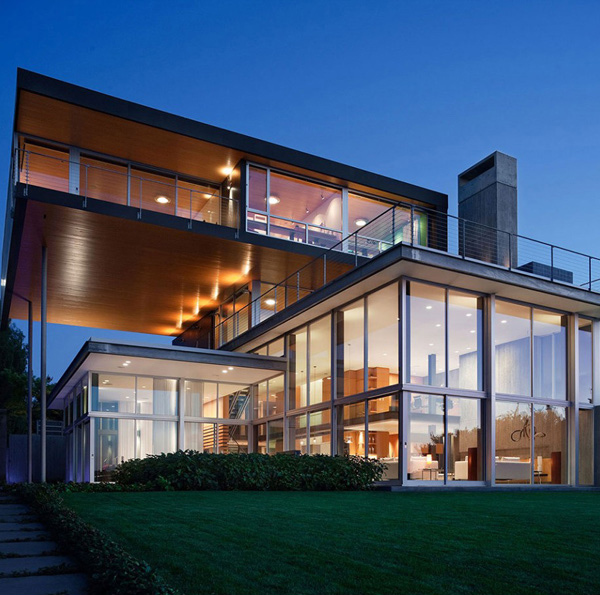 Spotted here is exceptional house design that is made up of glass, concrete and wood elements. 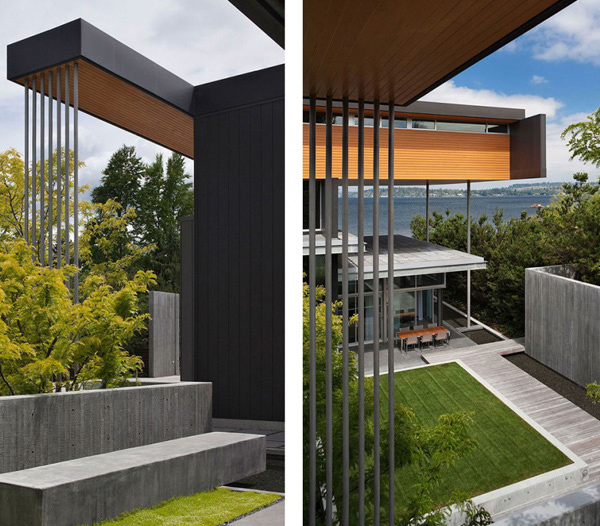 The cantilevered volumes of this residence are evidently underlines here. Let’s take a glimpse of the unique shapes, forms and lines that is relevant to the style of this home. The incredible style of the stairs matched with the design of the walls as well as the color of the furniture in the interior. The lightning that is installed in this interior is carefully arranged and paralleled to each other. This is the large room which is composed of the kitchen, living room and the dining area. 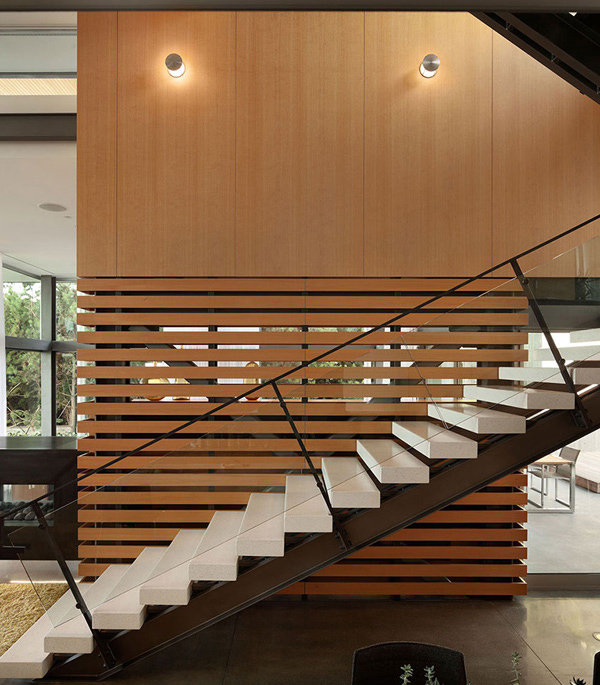 Notice the striped structure of the walls behind this stairs which is made up of a transparent glass railings and woods. Here is the pink bedroom in this house which is capable of viewing the beautiful and peaceful movement of the water in the ocean. The terrace in this house is a great way for the client to easily access to the nature. The high quality materials used in the furniture and furnishings in this living room is perceived through its comfortable design. 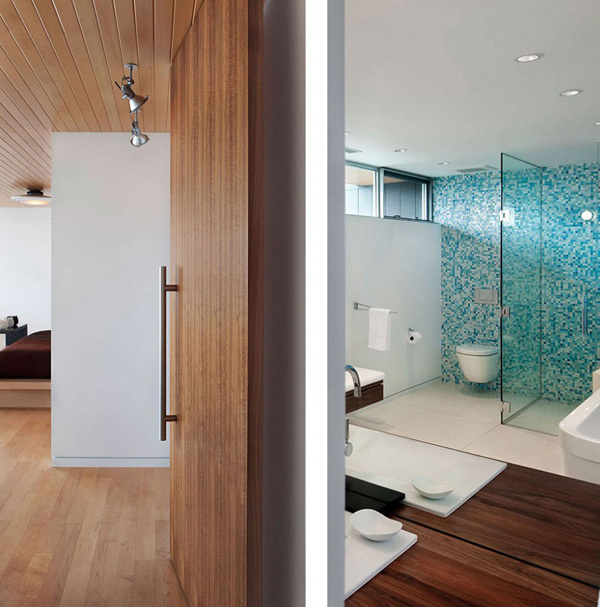 Let’s take a look at the fixtures and furnishings used in this neat and clean bathroom. The remarkable lights as well as the landscape add the beautiful features that is provided in this house. 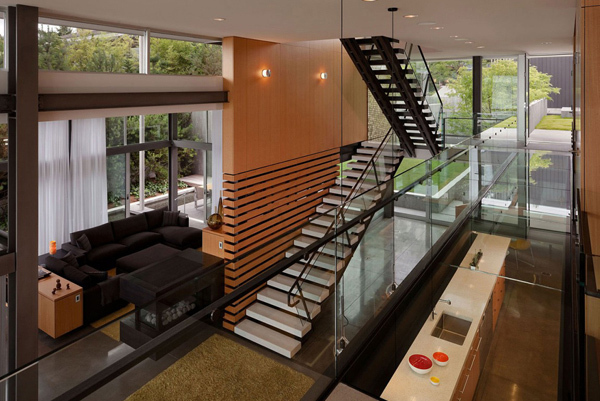 The extensive utilization of the glass materials in all the major parts of this home is well presented in this interior. This has truly had an exceptional design that was transformed into an artistic expression of the light which is captured by the walls. It has a cantilevered volume which merged in a unified design. Its uniqueness is capable of producing a feeling of mesmerizing respect for its beautiful design. And the open spaces as well as the double height rooms here makes this residence converted into a more artistic style especially the effects of the light. These lights can capture between the walls. This is one of the highlighted features in this house. Thus, this Graham Residence is successfully designed by the E. Cobb Architects . They successfully formed architecture with the elements of concrete, wood and glass. And the modern furniture and furnishings highlighted in the interior play the crucial part to make it look more sophisticated. The said fluid arrangement of the spaces in the interior referred as a contemporary lifestyle and required to connect with the nature that surrounded the site. Well, I hope that this house design today will give you a lot of new ideas and style that will be your guide in planning your future home. What do you think?